Automattic announced today the introduction of premium themes to their WordPress.com hosted blogging platform. With over 17 million blogs hosted, WordPress.com will definitely be a huge marketplace for theme developers worldwide. 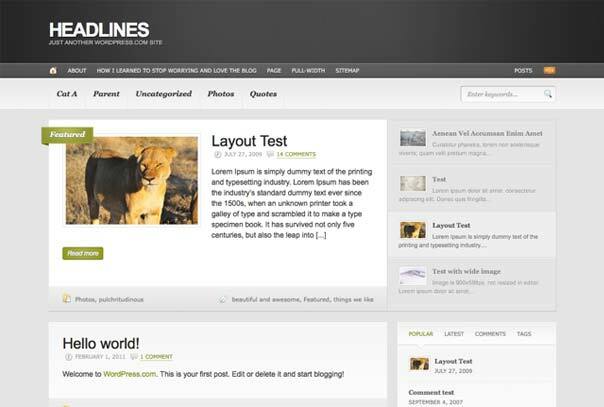 WordPress.com introduced its very first premium themes: Headlines (WooThemes) and Shelf (The Theme Foundry). Users can purchase and activate the premium themes by going to Appearance > Themes in the WordPress.com dashboard and look for the “Premium” link next to “Recently Added”. Drew Strojny mentioned on the The Theme Foundry blog that “a huge collaboration has been brewing for quite some time” with Automattic. Also, on WooThemes blog Mark Forrester said that “they were contacted by the theme wranglers at Automattic and asked if they would like to offer one of the first two premium themes on WordPress.com” and of course they agreed. We’re looking forward to Automattics promise to expand the collection of themes on WordPress.com in a big way in 2011.